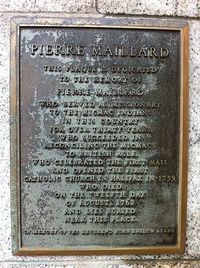 MAILLARD (Maillart, Mayard, Mayar), PIERRE (sometimes called Pierre-Antoine-Simon), priest of the Missions Étrangères and missionary; b. c. 1710 in France, in the diocese of Chartres; d. 12 Aug. 1762 in Halifax, Nova Scotia. Maillard arrived at Louisbourg, Île Royale, on 13 Aug. 1735 on the Rubis and began to study the Micmac language under the guidance of his predecessor, the Abbé de Saint-Vincent. Having a remarkable talent for languages, Maillard succeeded within a few months not only in mastering Micmac, despite the difficulties in pronunciation, but also in perfecting a system of “hieroglyphics” to transcribe Micmac words. He was thus able to write down in note-books the formulas for the principal prayers and the responses of the catechism so that the Indians might learn them more easily. This system was worked out during the winter of 1737–38, according to the Abbé Jean-Louis Le Loutre*, who had come to help Maillard in the Micmac missions. For his part Maillard mentioned that the winter he had spent with Le Loutre had furnished him with “an excellent opportunity to learn through teaching his fellow religious.” In fact, the two missionaries spurred each other on in their apprenticeship, but the master, without any doubt, was Maillard, who “is a naturalized Indian as regards language.” Indeed, he even succeeded in acquiring the gift of rhyming at each member of a sentence, which was the genius of that tribe, so that he reached the point of “speaking Micmac with as much ease and purity as do their women who are the most skilled in this style.” It is therefore not surprising that he was used by the officials at Louisbourg to train officers as interpreters. Did Maillard really invent the sign method which facilitated his linguistic work? The question has not been resolved. In 1691 Father Chrestien Le Clercq* mentioned that he had devised a similar method to catechize the Micmacs of the Gaspé Peninsula. If we accept William Francis Ganong*’s learned deductions, we can accept that in the 17th century Le Clercq had systematized and expanded a custom that the Micmacs had of setting down short messages by means of diagrams. Maillard would seem simply to have taken up and perfected the same procedure, and done so all the more easily because its usage had become widespread since Le Clercq’s time. It is possible, however, that the missionary did not know that he had been preceded in this matter. In any event, it must be acknowledged that Maillard was the great specialist in the Micmac language; the numerous works that he left behind him bear this out. At the same time as he was absorbed in linguistic studies, Maillard was devoting himself to his apostolic task. Every year he had to visit all the settlements on Île Royale, Île Saint-Jean (Prince Edward Island), and, until Le Loutre arrived, those in English Acadia (Nova Scotia). His intermittent presence among the Indians made missionary work difficult. Consequently Maillard kept asking the authorities for a church and presbytery in order to set up a regular mission which would prevent “the Indians on this island [from being] wanderers or vagabonds.” His wish kept being deferred so that he himself assumed the cost of the buildings that he constructed after 1754 on Île de la Sainte-Famille (today Chapel Island) in the south of Grand Lac de La Brador (Bras d’Or Lake), where his main mission was located. Nevertheless, he received reimbursement of 3,000 livres in March 1757. It was probably during these years, when he was establishing his missionary work, that he wrote his long “Lettre . . . sur les missions micmaques” of unquestionable historical value. In it he sets out in detail his views on the Indians’ customs and the missionary’s work. His remarks on the Micmac language, his models for sermons, his reflections on the problem of alcohol and the torturing of prisoners, and above all the interpretation that he gave of the murder by the Micmacs of Edward How deserve to be mentioned in particular. The political and religious authorities were not long in recognizing in Maillard an exceptional person: the minister of the Marine, Maurepas, Abbé de L’Isle-Dieu, and Bishop Pontbriand [Dubreil] did not conceal their esteem for him. It is not surprising, therefore, that in 1740 he was appointed the bishop of Quebec’s vicar general for Île Royale. In 1742 the provincial of the Recollets of Brittany, who were responsible for the ministry at Louisbourg, asked that the new men he was sending there be independent of the vicar general of Île Royale. This request brought about a quarrel between Maillard and the Recollets. Scandalized by the conciliatory attitude of the Recollets towards “the disorders and dissoluteness in the colony,” the missionary lost no opportunity to criticize them. His severity led Duquesnel [Le Prévost] and François Bigot* to demand Maillard’s recall. Bishop Pontbriand, however, was not ready to approve this recall, for he considered it an attempt “to escape his episcopal jurisdiction.” His opinion commanded all the more respect since in the mother country Maillard’s presence among the Micmacs was considered indispensable. 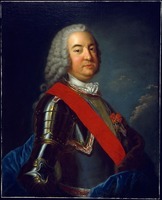 In 1744 the bishop was obliged, nevertheless, to divide the vicar general’s powers between Maillard and the superior of the Recollets in Louisbourg. The conflict died down momentarily during the War of the Austrian Succession, particularly after the capture of Louisbourg, but it flared up again after 1750, when the chief protagonists returned to Île Royale. This time Maillard had even fewer qualms about being severe, since he now had a protector in the person of the Abbé de L’Isle-Dieu. Indeed, the latter had received many complaints about the canonical irregularities and the delinquencies of the Recollets, and he was actually thinking of replacing them, for, he claimed, “six secular priests would do more work than nine Recollets.” In 1751 he took the initiative of sending Maillard the bull announcing Benedict XIV’s jubilee, together with instructions which left no doubt about what he thought of the Recollets’ authority. The following year Maillard formally organized the celebration of the Holy Year, with ceremonies, sermons, and processions, and thus asserted his authority over all the clergy on Île Royale. In 1754 Bishop Pontbriand confirmed him in his functions as vicar general, which he exercised henceforth alone. The bishop also authorized Maillard to force the Recollets to submit to his jurisdiction, a solution which is proof both of Maillard’s prestige at Louisbourg and of the influence which the Abbé de L’Isle-Dieu was acquiring in running the affairs of the church of Canada. Even more than with his ecclesiastical administration, Maillard’s name is associated with the important political role which he played on Île Royale and in Acadia during the final years of the French régime. This role seems to have fallen to him quite naturally at the opening of hostilities between France and England in 1744, for Maillard was needed to direct the Micmacs’ movements in the military campaigns. 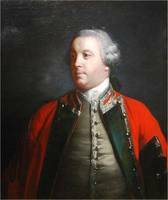 He was present at the siege of Annapolis Royal in 1744, and some time after the fall of Louisbourg, in June 1745, he encouraged his Micmacs to make raids against the British occupation forces. At the end of 1745 he was taken prisoner, probably through treachery. He was sent to Boston, and from there to France. 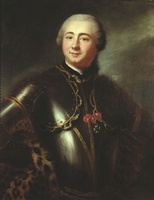 In 1746 he returned to Acadia with the fleet commanded by the Duc d’Anville [La Rochefoucauld] and took an active part in the military campaigns during the winter of 1746–47 directed by Jean-Baptiste-Nicolas-Roch de Ramezay*. He saw to it that some Micmacs took part in them and sought supplies from the Acadians for the Canadian troops. On 11 Feb. 1747 it was he who gave general absolution at three o’clock in the morning before the famous battle of Minas which was to put the British garrison to flight [see Arthur Noble]. 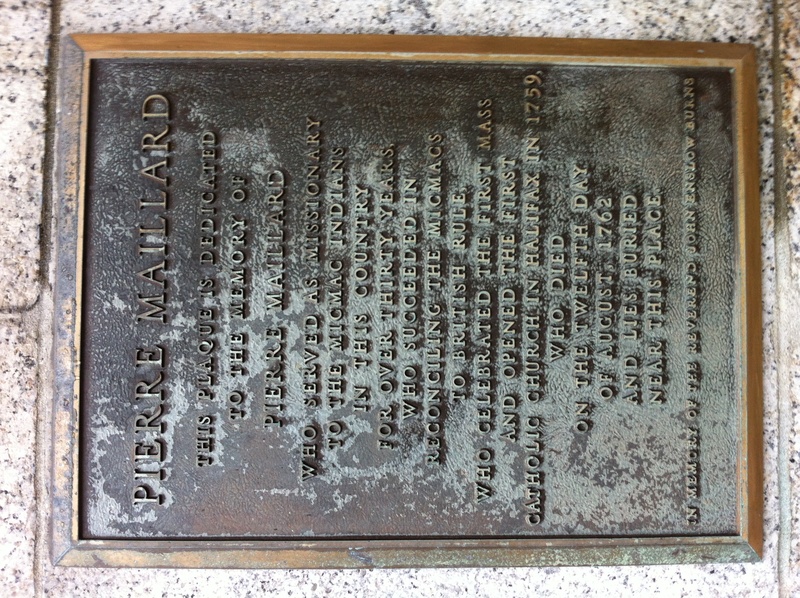 The founding of Halifax in the summer of 1749 involved Maillard even more directly in political matters. On 23 Sept. 1749 the Micmacs declared war on the British who had settled on Chebucto Bay. In transcribing the Micmac text of this declaration of war, along with its translation, for the Abbé Du Fau, one of the directors of the Séminaire des Missions Étrangères, Maillard commented: “The Indians are really forced to defend themselves as they can and to prevent the British from becoming entirely the masters of the interior of Acadia.” It is clear that the true aims of this war were to put obstacles in the way of British settlement and that Maillard was the intermediary between the officials at Louisbourg and the Micmacs. It has, moreover, been shown that the anonymous report entitled “Motifs des sauvages mikmaques et marichites de continuer la guerre contre les Anglais depuis la dernière paix” (“Motives of the Micmac and Marichite Indians for continuing the war against the English since the last peace”), which was sent by the Comte de Raymond*, governor of Louisbourg, had been prepared and written by Maillard himself. 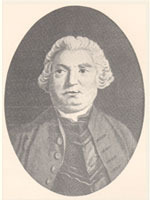 Edward Cornwallis*, the governor of Halifax, was so firmly convinced of Maillard’s role in the war that he made the missionary “the most advantageous offers, both by word of mouth and in writing . . . to have him go to live at Minas.” It is worth noting that the pension for Maillard that had been sought from the king of France for nearly two years was thereupon granted him. In August 1750 the missionary was awarded a pension of 800 livres from the Abbaye de Chaux. Moreover, Maillard and Jean-Louis Le Loutre also obtained an assistant, whom they had been requesting for several years. The new arrival was the Abbé Jean Manach, whom Maillard hastened to initiate into the difficulties of the Micmac language. “In the circumstances in which the Indians are at present,” Maillard wrote to the Abbé Du Fau in 1751, “it is not possible for any one of us to abandon them without exposing them to the opportunity of going over unfailingly to the British, who are only watching for the right moment.” From his mission on Île de la Sainte-Famille Maillard kept the Micmacs in a state of war, and continued to do so until 1758. Five days after the beginning of the second siege of Louisbourg, Maillard, at the request of Governor Drucour [Boschenry], tried vainly to persuade Charles Deschamps* de Boishébert, a Canadian officer, to march on the town with a force of Indians and Acadians in order to try to run the blockade. Maillard always remained convinced that this strategy could have changed the course of events. After the fall of the fortress the missionary took refuge with his Micmacs at Miramichi Bay where a large number of Acadians who had escaped deportation in 1755 were gathered. “Here I see only the greatest distress and poverty,” he wrote to the Abbé Du Fau. “All the families who have come over to us are starving.” Earlier he had made a short stay on Île Saint-Jean, where the settlers were hoping that they would not be disturbed by the British. But, in 1758, the deportation of the Acadians from Île Saint-Jean only added to the number of refugees south of the Baie des Chaleurs. Maillard then decided to settle at Malagomich (Merigomish, N.S. ), to spend the winter “in a cove which the British do not know,” and to bring together there all the Micmacs from the east coast. He also planned to go to Quebec to ask for help, but it is not known whether he was able to make this trip. On 26 Nov. 1759 Maillard was still at Malagomich, where he accepted from Major Henry [Alexander?] Schomberg peace conditions which he considered “good and reasonable.” Other missionaries, such as Manach and Joseph-Charles Germain*, did the same. These initiatives led the French officer Jean-François Bourdon de Dombourg to compile an incriminating dossier against the missionaries, which he sent to Pierre de Rigaud* de Vaudreuil. 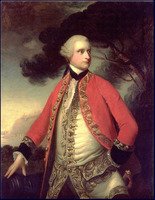 The governor of Canada reacted violently against the missionaries, accusing them of treason, and in the spring of 1760 he sent an officer, Gabriel-François d’Angeac*, to Restigouche to investigate this affair. It was probably to this officer that Maillard wrote in 1760 an impassioned letter in which he declared that he had been slandered and that he hoped that he would have the opportunity to reestablish himself in Vaudreuil’s presence “by summing up 23 years . . . spent in this country in the service of our Religion and our Prince.” He had indeed treated for peace with Schomberg, not treasonably, as Vaudreuil claimed, but because of his powerlessness and because he realized that the Acadians, the Micmacs, and their missionaries had been completely abandoned. Nothing can better illustrate the missionary’s moral distress at this time than a letter that he wrote to a British officer to advise him to be tolerant toward the Acadians; he ended the letter thus: “If through the misfortunes of the times and the fortunes of war I am now enchained, I love my chains because you have made them seem agreeable to me, to the point that I wish that you will not break them for a good while.” This letter probably coincided with Maillard’s decision to accept the invitation of the governor of Nova Scotia, Charles Lawrence, to go to Halifax to cooperate with the British authorities in the pacification of the Micmacs. 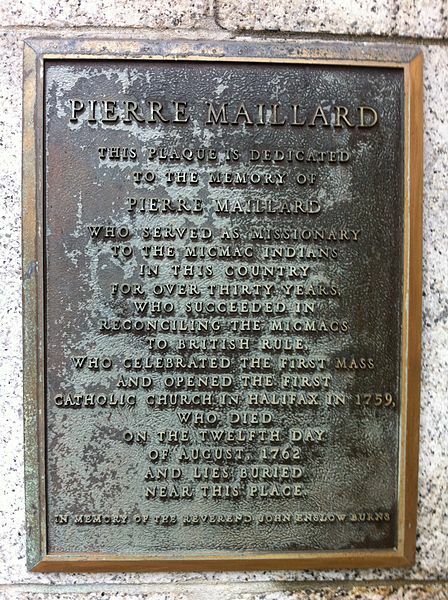 In the upheaval of 1760 Maillard had been confirmed in his functions as vicar general for all the territory of Nova Scotia, since Acadia no longer existed. From Halifax he tried to communicate with the Acadians who were dispersed about the surrounding territories. In 1761 he even corresponded with the Acadian colony at Salem, Massachusetts, and gave Louis Robichaud*, the son of Prudent Robichaud and leader of the little community, permission to receive “the mutual consent . . . of all those men and women who may wish to be joined in marriage.” This letter shows that Maillard considered himself at that time to be the spiritual leader of all the dispersed Acadians. Although they were without news of the missionary, the French religious authorities tried vainly in July 1762 to impose him upon James Murray* as superior of the seminary of Quebec. Everything indicates that Maillard was not aware of this final honour which it was desired to confer upon him. In July 1762 Maillard fell seriously ill. 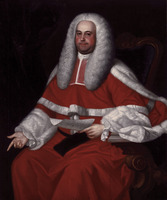 He was cared for by his faithful followers as well as by Thomas Wood, a former surgeon-major who in 1759 had become chaplain to the House of Assembly at Halifax. On 12 Aug. 1762 Pierre Maillard died in Petitpas’s home, attended at his own request by the Anglican clergyman, Thomas Wood, who gave an account of his death and added that he had recited the office of the visitation of the sick in French. He received a state funeral organized by the government of Nova Scotia. The pall-bearers included Jonathan Belcher*, the president of the council, and William Nesbitt*, the speaker of the assembly. The government thus recognized the great services that Maillard had rendered in the pacification of the Indians as well as the respect he had earned because of his strong personality. According to the Reverend Mr Wood, “He was a very sensible, polite, well bred man, an excellent scholar and a good sociable companion, and was much respected by the better sort of people here as it appeared.” With him disappeared the last missionary to Acadia. The historians who have written about Acadia in the 18th century are unanimous in their favourable opinion of Pierre Maillard, and this unanimity about a person from Acadian history seems exceptional. They try to outdo one another in praising his talents as a linguist, his missionary zeal, his devotion to the Micmacs’ cause, his loyalty to France, and his collaboration with the British after the fall of Louisbourg. Maillard represents beyond a doubt the true missionary, enlightened, particularly lucid in complicated situations, always sure of where he stands, and passionate in expressing his opinions. He was probably one of the best ambassadors of the French cause in America in the 18th century. AAQ, 12 A, Registres d’insinuations, B, 324; Registres d’insinuations, C, 170–70v, 220; 22 A, Copies de lettres expédiées, I, 51; II, 516, 579, 681, 686, 795; 10 B, Registre des délibérations, 110, 113, 236v; T, Manuscrits Maillard; 1 W, Église du Canada, I, 235–37. ASJCF, Abbé Maillard, “Livre de prières en langue micmaque avec traduction française en regard.” ASQ, Carton Laverdière, 11–20, 117a; Fonds Casgrain, Acadie; Fonds Verreau, “Ma saberdache”, X, 26; Grand livre de délibération, 1734–1736 ff.30, 31; Lettres, M, 85, 91, 113, 118; P, 60–75, 77–79, 120; R, 87–93, 190; mss, 196; Polygraphie, VII, 5, 112; XI, 3; XIII, 66; Séminaire, IV, 91; IX, 1; XIV, 6, nos.3–4, 6, 14; XV, 66. AN, Col., B, 70, f.393; 74, f.554; 76, ff.350, 352, 500; 77, f.64; 78, f.392; 81, f.307; 83, f.265v; 86, ff.106, 233v; 90, f.209; 91, ff.352, 363; 92, f.171v; 95, f.294; 105, f.227; 112, f.498v; 115, f.349; C11A, 78, f.407; 82, f.326; 83, ff.3–36; 86, ff.260–69; 87, ff.314–61, 365; 89, f.266; 93, ff.80–86; 105, ff.31–42, 71–73; 107, ff.76–77; C11B, 20, f.85; 26, ff.38, 48–54; 28, ff.60–62; 29, f.81; 31, ff.51, 116; 37, f.39; C11C, 9, ff.100–1. ... Coll. de manuscrits relatifs à la N.-F., III, 359, 369, 410, 439. Coll. doc. inédits Canada et Amérique, I, 5–39, 47–52, 55–69; II, 58–75. Le Clercq, New relation of Gaspesia (Ganong). Derniers jours de l’Acadie (Du Boscq de Beaumont). “Lettres et mémoires de l’abbé de L’Isle-Dieu,” APQ Rapport, 1935–36; 1936–37; 1937–38. [Pierre Maillard], Grammaire de la langue micmaque, J. M. Bellenger, édit. (New York, 1864); “Lettre de M. l’abbé Maillard sur les missions de l’Acadie et particulièrement sur les missions micmaques,” Les soirées canadiennes; recueil de littérature nationale (Québec), III (1863), 289–426. N. S. Archives, I, 184–85. Pichon, Lettres et mémoires. PAC Report, 1894, 101–2, 120, 132–33, 147–48, 154–56, 237; 1905, II, pt.iii, 186–95, 206–7. Le Jeune, Dictionnaire. Casgrain, Un pèlerinage au pays d’Évangéline, app. i; Une seconde Acadie, 160, 205, 334, 336, 347; Les Sulpiciens en Acadie, 21, 181, 215, 366–67, app. Gosselin, L’Église du Canada après la conquête, III, 306–8, 349, 361, 365, 375–90. Johnson, Apôtres ou agitateurs.. ... J. E. Burns, “The Abbé Maillard and Halifax,” CCHA Report, 1936–37, 13–22. N. M. Rogers, “Apostle to the Micmacs,” Dal. Rev., VI (1926–27), 166–76. Albert David, “L’apôtre des Micmacs,” Revue de l’université d’Ottawa, V (1935), 49–82, 425–52; VI (1936), 22–40; “Une autobiographie de l’abbé Le Loutre,” Nova Francia, VI (1931), 1–34; “Messire Pierre Maillard, apôtre des Micmacs,” BRH, XXXV (1929), 365–75; “Les missionnaires du séminaire du Saint-Esprit à Québec et en Acadie au XVIIIe siècle,” Nova Francia, I (1925–26), 9–14, 52–56, 99–105, 152–59, 200–7; “A propos du testament de l’abbé Maillard,” Nova Francia, II (1926–27), 99–109, 149–63. Micheline D. Johnson, “MAILLARD, PIERRE,” in Dictionary of Canadian Biography, vol. 3, University of Toronto/Université Laval, 2003–, accessed April 24, 2019, http://www.biographi.ca/en/bio/maillard_pierre_3E.html.